I recently came across Dosha Pops, all natural lollipops that are meant to promote healing based on the 5,000 year old Indian principles of Ayurveda. 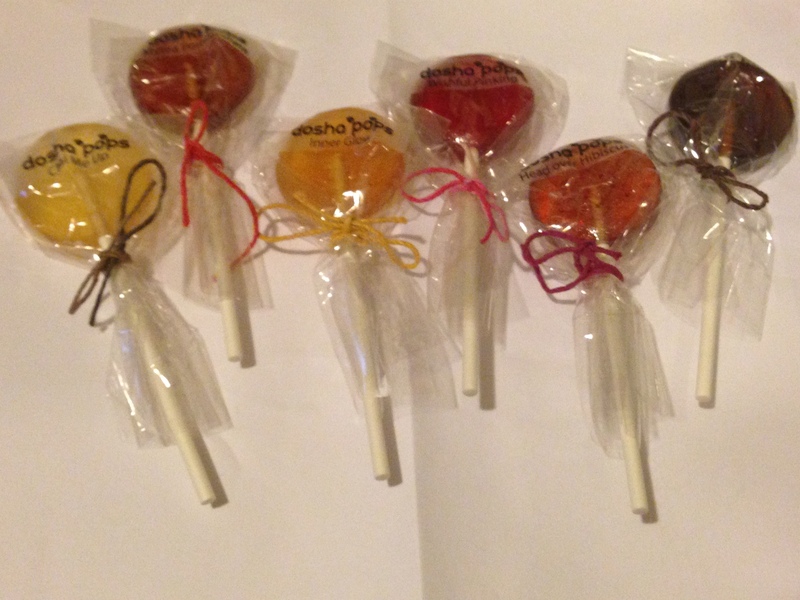 I was given a sample of the lollipops to try out and see what I thought of them. From the Dosha Pops website, Ayurveda is “made up of two Sanskrit words: Ayu which means “life” and Veda which means “knowledge.” Simply put, Ayurveda is the “knowledge of life.” Over 5,000 years old, it started in India as a system of healing that provided guidance around food and lifestyle behaviors.” There are three energies based on the five elements that are balanced within a person – Vata, Pitta, and Kapha – and the lollipops are supposed to have healing properties based on which Dosha you are. By filling out a form on the Dosha Pops website, you can learn which Dosha is prevalent within you and which pops are the most appropriate for you. The website told me that I was a Kapha and that I should eat more spicy foods and the like to maintain my balance. The information on the different Doshas also include recommendations on which pops to eat based on your Dosha. The first pop I tried was the Head Over Hibiscus. According to their site, it is “Winey, tangy, and assertive, this sour lollipop delivers a sophisticated taste with lots of body.” The pop lived up to their claims, being winey and tangy but not having the syrupy taste that I recall from lollipops (admittedly I haven’t had a lollipop in a long time). It had a much lighter flavor due to the use of cane sugar rather than high fructose corn syrup and other related pseudo sugars. The ingredients of the Dosha Pops are all natural, which give them their light flavor. The pops are a mix of cane sugar, tea, and other ingredients. Each of the individual pops on the website show their exact ingredients and their health properties, so I won’t list all of them here. The website does not list calories or any other nutritional information, but it isn’t as bad as refined sugars and the other things one normally finds in candy. 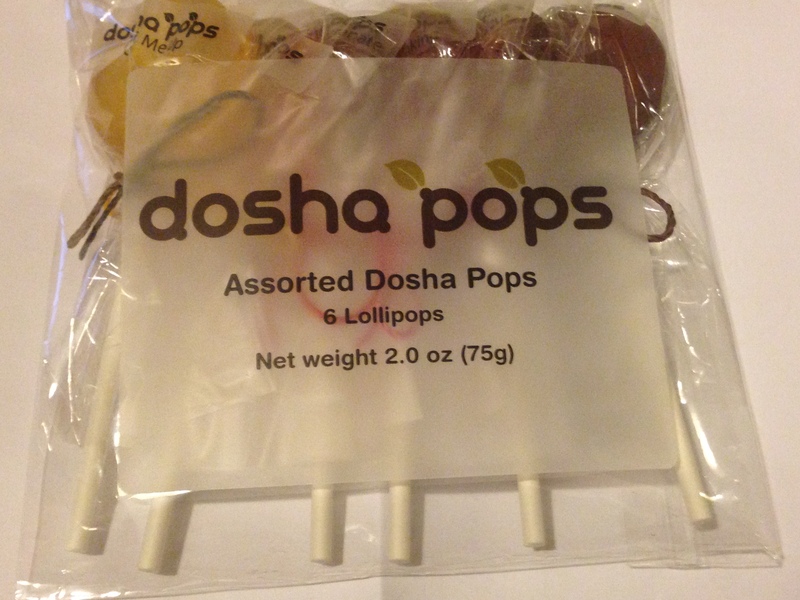 The Dosha Pops are a healthy, sweet snack that I really enjoyed. Although I haven’t tried all the different flavors yet – or even all the flavors for Kapha yet – I look forward to it. Dosha Pops are definitely the kind of snack I could keep around for those afternoons when I really need some sugar to keep me going.